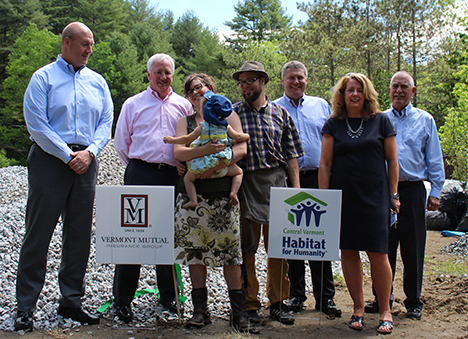 Recently Central Vermont Habitat for Humanity had its Groundbreaking Ceremony for a new passive home being built in East Montpelier, Vermont. Aside from financial and volunteer assistance from Vermont Mutual Insurance Group, others involved with this project include: Montpelier Construction, the Norwich University School of Architect and Art, Stonorov Workshop, VHCB, ReSOURCE YouthBuild, Jan Ruta Electric. The celebration began with a speech from Debbie Goodwin, Executive Director of Central Vermont Habitat for Humanity, along with a Collaboration Acknowledgment from Building Chair, Bruce Landry. Dan Bridge, President and CEO of Vermont Mutual, thanked Central Vermont Habitat for Humanity for the great work they do and how pleased Vermont Mutual is to be able to provide financial and volunteer assistance to such a worthy cause. The celebration continued with a Shovel Presentation by Debbie Goodwin to the Partner Family: Stephanie Boucher, Nick Dentico and daughter, Amelie. A blessing was given by Rev. Elissa Johnk Pastor, followed by the ribbon cutting and refreshments.